Fire Note Says: The Flaming Lips return from the cosmos to spread their tale of the King that saved us all! Album Review: Within The Flaming Lips ethos, Record Store Day has always been held in high regard. Record ideas include: A Various Artists record pressed with the performers blood inside, a collaboration with Dogfish Head brewing for a beer infused record, the off-kilter oddity that is 7 Skies H3 (edited cut of their 24 hour song), The Mushroom Tapes which were demos from the In a Priest Driven Ambulance sessions featuring Jonathan Donahue from Mercury Rev on guitar, Various 7″ records of past material. As I said, The Flaming Lips are no strangers to the vinyl holiday. Which is why they’ve returned with their newest project King’s Mouth. The King’s Mouth was a project even before it was turned into a musical thing. The origins start way back in 2011 with the creation of the WOMB art installation. Coyne co-started it with collaborators Rick Sinnett and Jake Harms. As a part of the installation, The King’s Mouth is an audio/visual experience (You can see a 4 part series about the King’s Mouth on the Lips YouTube channel). Fast forward to today and we have a whole musical narration that features Mick Jones of the Clash. 2017’s, Oczy Mlody saw the Lips return to more joyous tendencies. King’s Mouth has the Lips continue that streak in a more simplistic form. The album takes its cosmic identity from the film/musical project Christmas on Mars but, rekindle joys felt during albums such as The Soft Bulletin and Yoshimi Battles the Pink Robots. The opener, “We Don’t Know How And We Don’t Know Why,” sets the stage with the birth of the king and the death of his mother. “The Sparrow” gets contemplative as Wayne Coyne analyzes life’s fleeting moments. “How Many Times” not only has some of the most fun counting you’ll ever here but, it guitars will surely have you recalling “Yoshimi Battles The Pink Robots Pt. 1.” “Electric Fire” has the Lips going big with sounds that invoke the birth of a galaxy and the collapse of a star. “All For The Life Of The City” is one of the strongest Lips tracks in years. Its bounce, effects, and breakdown can do nothing but, insight some of the most joy I’ve ever received from a Flaming Lips song-even if the lyrics can get a bit morbid. “Feedaloodum Beedle Dot” funkifies the decapitation of the king after his death. “Funeral Parade” and “Dipped In Steel” document the moment and preservation of the king’s head. The final tracks, “Mouth of The King” and “How Can A Head,” deify and glorify the King. For even in death, the king will live on with the people. His life and great deed will never be forgotten, for you can visit his head anytime. It feels like the most optimistic ending to a Lips record in a long time. What makes this album special is all the little details peppered in and the specific Lips moments that they recall. Now, why the 3.5 headphones review? 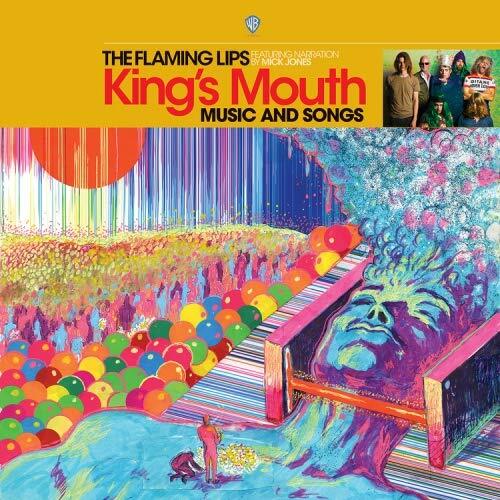 It may be unfair to hold this album up to some of the most important releases in the Flaming Lips catalog but, it does mimic a lot of things that made those albums stand out. Is this a semi-simplified rehash of golden-age mid-period Flaming Lips? Yes. But, is this one of the best releases that the Flaming Lips have released for Record Store Day? Yes. If you’re a Lips fan and are worried that this isn’t for you, then think again.